Fireworks are great fun for families and friends, and are a wonderful addition to any celebration, not just on Bonfire Night and New Year’s Eve but all year round. However, despite annual fireworks safety tips and warnings, fireworks can still result in injury when they are not treated properly. There are many tips for fireworks safety that can help you set up and set off a great display. Check out our full Fireworks Safety Guidelines for all the tips and guidelines. Below are our top 10 tips for fireworks safety, both for fireworks at home and for the larger displays, organised by groups such as schools and parish councils. 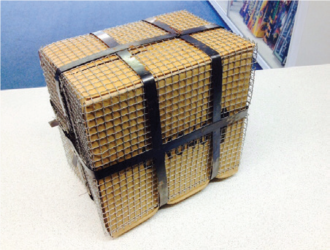 Please take care when unpacking your fireworks, particularly if they are enclosed in a pyro-mesh cage. We recommend wearing gloves and using strong scissors/snips to remove the metal bands. Please be aware the metal can be very sharp once cut. 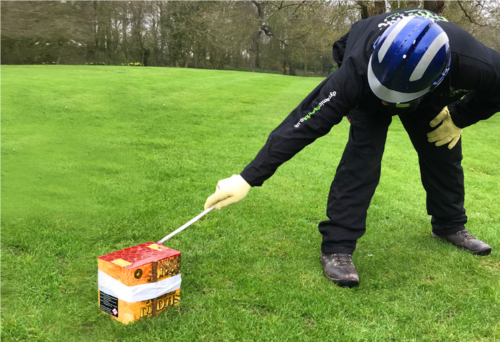 Please ensure you read any fireworks safety guidelines or firework safety warnings on the packaging of your fireworks before setting up your fireworks display, as they will offer advice on how to use and set off safely. Each firework will have its own safety requirements, for example the set up for a rocket will be different to a cake or barrage. We recommend reading the fireworks instructions early to avoid any rushing when setting up your firework display. Each firework will come with a minimum safety distance, but what a lot of people don’t realise is that this is the recommended distance away from ALL OBJECTS, not just the crowd. Yes, your fireworks may be 25m away from your spectators, but are they also 25m away from other things which may cause a hazard? Also ensure that any overhead obstructions are also avoided. 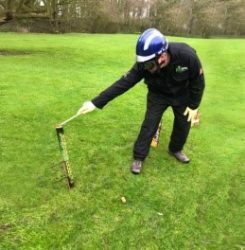 Please carefully consider the area where you will set off your fireworks, as the fireworks safety distance available may impact the size or category of fireworks you should buy. 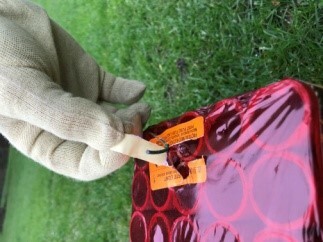 We recommend using gloves at all times when handling your fireworks, from the unpacking through to setting off. Safety glasses or goggles are also a good idea to protect your eyes during the display. 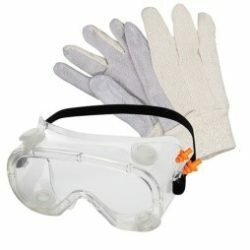 Our goggles, gloves and ear plug kit is a great addition for your safety wear for your firework display. For your larger displays, it is also wise to consider wearing head protection such as a hard hat. This is something that is really important; please ensure that all barrages, candles, mines and fountains are secure on the ground. When securing them to a stake, make sure the stake is the side facing the crowd. 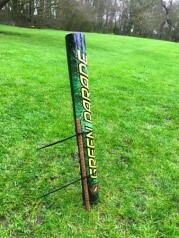 This prevents the firework from tipping over when it ignites and during firing, and is a vital part of keeping yourself and your spectators safe. Each firework will come with its own instructions for setting up, so please ensure you read the packaging. Always light your fireworks at arm’s length, standing sideways (not towards the firework). NEVER stand or put any part of your body over your firework when lighting. Once lit, retire immediately to the stated distance and wait for the firework to completely finish before stepping forward to light the next. The use of Portfires recommended. They are a professional taper designed for lighting fireworks safely, with a long burning duration of about four minutes. Fuses can be easily located, they are usually indicated by a bright orange sticker and labelled with the words FUSE or FIRST FUSE UNDER THIS COVER. Please be aware that some fireworks will contain two fuses, the second fuse will be labelled clearly, and may also be called the reserve fuse. Only light the second fuse in the unlikely event the first fuse fails, as the reserve will light your firework backwards, and we NEVER recommend lighting both firework fuses at the same time. Bad weather is a concern for many, especially around Bonfire Night. Luckily, it is easy to prepare for this and protect your fireworks against potential rain. With the fireworks fusing being most susceptible to moisture. 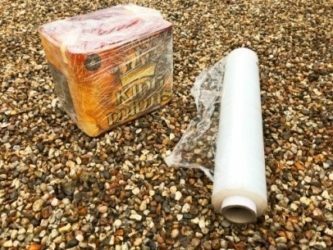 Plastic bags, bin liners and cling film can all be used to waterproof your fireworks, (do not use on Rockets and Catherine Wheels) just before lighting expose the fuse through the cling film. Then once lit the fireworks will have no issue firing through a single layer of plastic. It is very rare for a firework to fail once lit, but if your firework doesn’t ignite please follow these important steps. Firstly, DO NOT approach your firework immediately, please wait at least 15 minutes, as the firework may still have slow burning embers which may still ignite the firework. You may then light a second fuse if there is one. 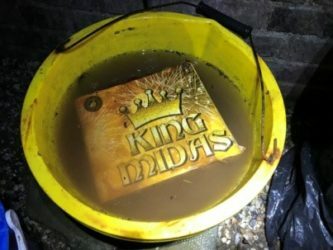 If there is no second fuse, wait 60 minutes before handling and then place the firework in a bucket of water to soak for 24 hours before disposing. It is illegal to let fireworks off after 11pm at night and before 7am in the morning. EXCEPTIONS: New Year’s Eve, Diwali and Chinese New Year which is 1am and Bonfire Night which is midnight. We also recommend alerting neighbours to your display, especially if there are any young children, elderly, veterans or pets within the vicinity. Please ensure all firers are over the age of 18 and are familiar with the fireworks, location of fuses, and safety instructions. Lastly, please make sure nobody smokes when handling or setting off the fireworks. In addition to the points above, please see some further advice below for the larger displays or any which are open to the public. Fire extinguishers, buckets of sand and water should be available on the night with marshals trained to use them. First aid posts should be present, manned by trained stewards and clearly signposted. Firstly, ensure you have obtained permission from the landowner where the display is to take place. When setting up the display, please measure the safety distance then this area should be roped off and marshalled to prevent spectators from getting too close. 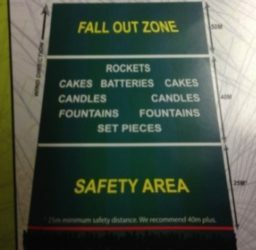 Please also allow a ‘fall out zone’ behind the display in the direction of the wind to account for falling debris. Do not position the crowd on more than one side or so that the wind carries the fireworks effects or debris in their direction. Allow a cool down period of at least 20 minutes before proceeding to check the site for any fireworks that have failed to ignite, if any are found leave at least 60 minutes and then submerge in water. Fireworks will remain hot for a while after firing, so allow time to cool and then be careful when handling. Never put used fireworks on a bonfire. Some fireworks can leave sharp debris. Lastly, please ensure the land is clear of all debris and rubbish. Keep these fireworks safety tips in mind when storing, unpacking and using fireworks to make it a safe event. Here at Dynamic Fireworks, we wish all of our customers an enjoyable and safe display. With that in mind, please do get in touch if you would like any further help with your fireworks.